"Otis 'Big Smokey' Smothers (March 21, 1929 – July 23, 1993) was an African-American Chicago blues guitarist and singer. He was a member of Howlin' Wolf's backing band and worked with Muddy Waters, Jimmy Rogers, Bo Diddley, Ike Turner, J. T. Brown, Freddie King, Little Johnny Jones, Little Walter, and Willie Dixon. His younger brother, Abe (born Albert, January 2, 1939 – November 20, 2010), was the bluesman Little Smokey Smothers, with whom he is sometimes confused. Smothers was born in Lexington, Mississippi, and was taught by his aunt to play the harmonica and the guitar. He relocated to Chicago in 1946. 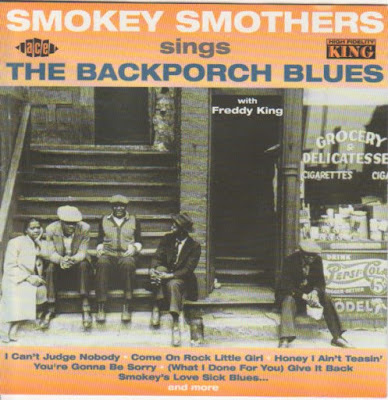 ... His album Smokey Smothers Sings the Backporch Blues, produced by Sonny Thompson, with Freddie King on lead guitar, was released in 1962. A subsequent session produced four tracks, including 'Twist with Me Annie', a reworked version of 'Work with Me, Annie'. As a part-time member of Muddy Waters's backing band, Smothers played on 'I Got My Eyes on You' in 1968. ..."